Two World Masters of 3 Dimensional Art joined forces to create Il Legno in Vetro (The Wood in Glass). Livio De Marchi’s Wood Sculptures were translated to Glass by Pino Signoretto. This Pauly Exhibit opened in Saint Mark’s square in Venice, April 2000. Part of this Exhibit will be shown – for the first time outside Venice – by Mostly Glass Gallery in SOFA Chicago, November 2000 and afterwards in Englewood NJ. The Glass Sculptures are of a limited edition. Livio is known internationally for his very likable Wood Sculptures. He started his career reproducing antique pieces then moved towards figurative work. His fame was established through his realistic wood work. His Book Houses (La Casa dei Libri) that attract a lot of media attention. The outside & The inside of these houses are made of sculptured wood books (eg the roof is an inverted open book). The three built already are in the Venetian country side, in Germany and in Japan. A fourth Casa is being considered for the State of Oregon. 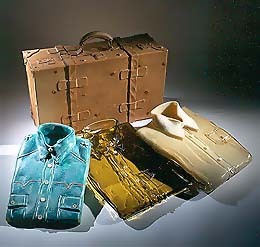 Livio’s Sculptures generated a lot of attention when Mostly Glass showed them in SOFA Chicago in 1999. Because of this exposure, the Ohio Craft Museum in Columbus is inviting him to join the Reality Check Exhibit, the fall of 2001. click here for more..
Pino’s versatility as a Glass Artist is legendary. In addition to the unique glass sculptures that he creates, he is sought after for a variety of creations in Glass. The perfection of his technique and the speed at which he recreates complex pieces in Glass are unmatched. The giant Horse that he recently rendered in Glass, is a unique achievement for this Art Medium. click here for more..
Pauly & C. – C.V.M. is one of the oldest and most respected Glass Company in Italy. Pauly’s Gallery is a landmark on St. Mark’s square. They are most famous for carrying the best of the traditional Muranese Glass Vessels and Chandeliers. Their multistory exhibit space in a Venetian Palace off St. Mark’s, is much more of a Museum than a Gallery. With Il Ligno in Vetro, Pauly is expanding its scope to include more novel and contemporary Glass Art. click here for more..
become transparencies, colors, shades and lights.